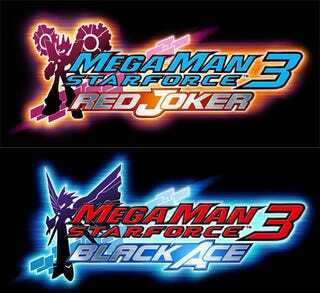 Mega Man returns two times to the Nintendo DS this summer, as Capcom announces two new titles in the Star Force Series - Black Ace and Red Joker. Mega Man Star Force 3 continues the Star Force saga, combining the tried and true blend of action and RPG with an all new "Noise Changes" mechanic. Both versions of the game contain more than 100 unique noises that can be combine to change Mega Man's look, granting him powers based off of the four elements - earth, wind, fire, and air. Players will be able to trade noises with each other with the Nintendo Wi-Fi connection. Mega Man Star Force 3 should be out for the Nintendo DS sometime this summer. Check out the screens below for some might morphing Mega Man action.